Goodwin Electrical are running a promotion from 10 July 2018 to 19 July 2018 where you will get 10% discount* when mentioning this promotion. We are your local NICEIC plymouth electrician experts who care about our customers. We are large enough to care and small enough to give that personal approach. Being NICEIC registered we can offer the NICEIC platinum promise where all notifiable work is covered by a 6 year warranty. Don’t be fooled by companies saying no VAT, this is not true unless they are paying the VAT on goods purchased. Many companies try and copy us, but we always research the latest products to improve your energy efficiency. These companies have trouble keeping up with us. *10% discount is off all labour charges when quote is accepted and booked in during promotion period with deposit paid for the work required. 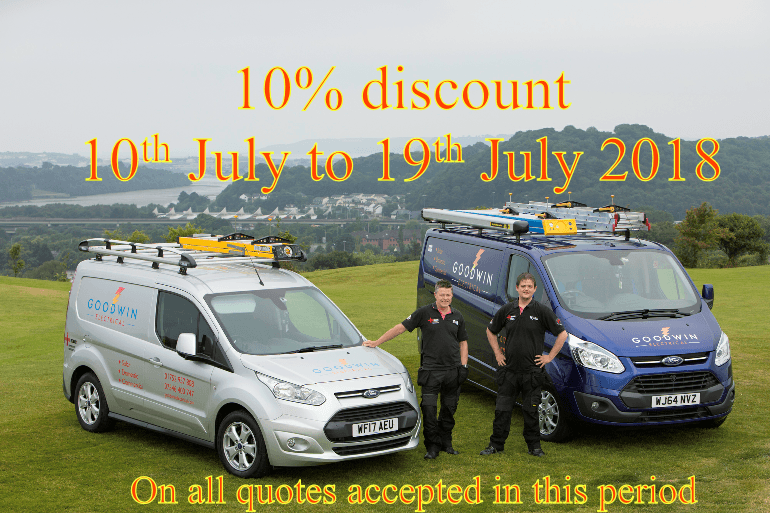 So for an Electrical company in plymouth who cares about our customers, give us a call now and save 10% on all quotes accepted between 10th July 2018 and 19th July 2018. You don’t have to panic thinking the work has to be completed before 19th July 2018. You only have to accept a quote in this period.